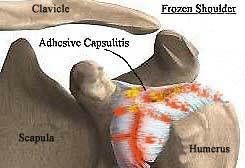 Frozen shoulder or Adhesive capsulitis is a very painful and disabling problem. It results in severe stiffness and pain in the shoulder. It often comes on after an unresolved injury or it can occur for no apparent reason. The 3 bones of the shoulder are: the scapula (shoulder blade), the humerus (upper arm bone), and the clavicle (collarbone). The capsule is fibrous bag that covers the joint and holds it together. It contains the synovial fluid which lubricates the shoulder. With a frozen shoulder, swelling of the joint makes the normally mobile parts of the joint capsule stick together - a little bit like when you slacken off Sellotape and it sticks to itself. This seriously stiffens the shoulder and causes great pain on movement. The cause of frozen shoulder is unknown. It may be an autoimmune reaction like hayfever, where the capsule of the shoulder is not recognised as being part of the body, and the body's defences start to attack it, causing great inflammation. Some unresolved shoulder problems like bursitis, rotator cuff tears, or impingement syndrome can end up leading to a frozen shoulder, which is why these conditions must be treated quickly. Pain and stiffness of the shoulder in all directions tells us what your condition is likely to be. The shoulder is stiff when you move it or when your Osteopath tries to move it. Most tasks are difficult with a true frozen shoulder. Your Osteopath will take a careful case history and then examine you in great detail, noting your ranges and quality of movement. He will do minor tests for trapped nerves and in rare cases may request an MRI scan. X-rays are usually not helpful, but an MRI scan showing the capsule and ligaments as well as the bones may be used. When a diagnosis has been reached, your Osteopath will discuss the treatment options with you. It is essential that you seek advice quickly because, apart from getting an accurate diagnosis, evidence shows that the sooner you consult your osteopath, the quicker you will be better! Treatment of frozen shoulder can be frustrating and slow. Most cases eventually improve, but the process may take several months. The goal of your initial treatment is to decrease inflammation and increase the range of motion of the shoulder. Osteopathic treatment is an important part of helping you regain the motion and function of your shoulder. Treatment is directed at getting the muscles to relax, gentle stretching of the joint capsule and gradually increasing the joint's range of movement. You will also be given exercises and stretches to do at home. You may need osteopathic treatment for 3 to 6 months before you get full shoulder movement and use back. Your osteopath may also recommend an injection of cortisone and a long-acting anaesthetic to get the pain and swelling down as quickly as possible. If progress is too slow, your osteopath may recommend manipulation under anaesthetic to aggressively stretch out the stiff shoulder before treatment begins. Laser therapy can be very helpful with this problem. If your doctor recommends an injection for your shoulder, you should plan on seeing your osteopath right after the injection. A gentle session of stretching right afterwards can help maximize the stretch to the joint capsule. Once your shoulder is moving better, treatment is directed toward shoulder strengthening and movement. Exercises to improve the muscle power and balance will also be given.